BE ENCHANTED BY THE MAGICAL WORLD OF HARRY POTTER AND EXPERIENCE WIZARDRY ONSTAGE! This 2 effect as event and entertainment specialist Milestone Production is bringing the magical world of Harry Potter to life. Tell the kids and Potterheads, there’s no need for them to wait for their letters to Hogwarts School of Witchcraft and Wizardry now that Potted Potter is in town! With Potterheads around the world eagerly awaiting for the release of the eighth Harry Potter book, Milestone Production is giving you a special chance to come and refresh your memory of all past seven Harry Potter books in 70 hilarious minutes. 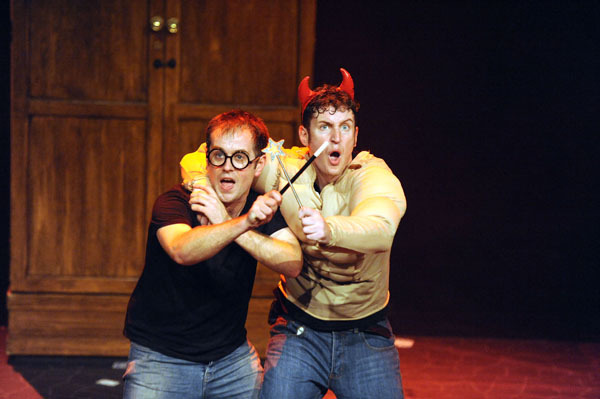 Based on J.K Rowling’s bestselling series, Potted Potter – The Unauthorized Harry Experience – A West End London Parody by Dan and Jeff takes on the ultimate challenge of condensing all seven Harry Potter books (in addition to a real life game of Quidditch) into a fun-filled stage production to be enjoyed by all. This Olivier-nominated production was created by two-time Olivier Award-nominated actors Daniel Clarkson and Jefferson Turner. Other shows this dynamic duo have produced include Potted Pirates, Potted Panto and the very recent Potted Sherlock. 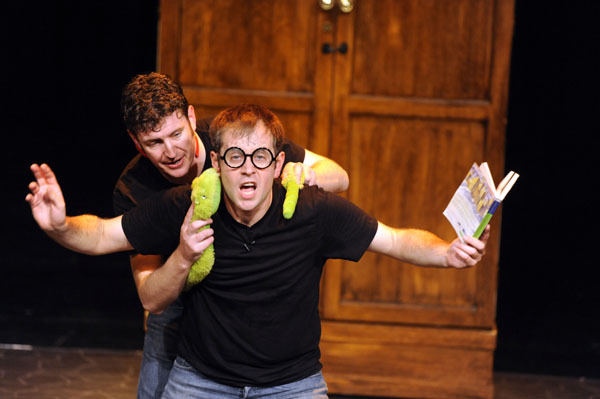 With Potted Potter now coming to our shores, here’s a chance for all Potterheads to relive their favourite parts of the novels in the company of likeminded fans. Having a sold out tour in North America, UK, Singapore and Manila since 2011, there is an estimate of 57,306 Potted Potter Facebook Fans will be keeping their eyes peeled towards the show’s next destination—Malaysia. Yes, that’s right. This delightful show is making a pitstop in Kuala Lumpur in June! 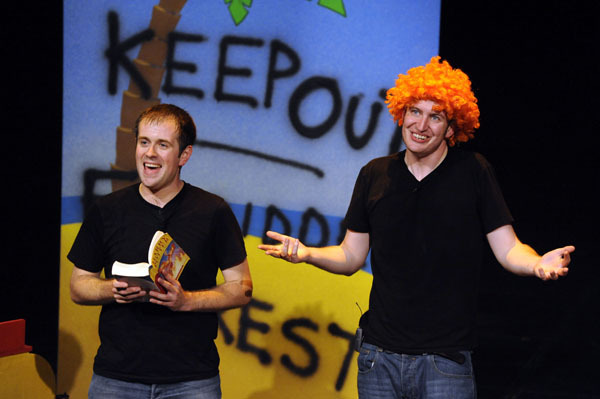 Expect to be entertained by Dan and Jeff as they translate these beloved books into a fun and engaging stage show at Kuala Lumpur Performing Arts Centre (klpac). Hailed as a ‘crowd-pleaser’ by the Guardian London, Potted Potter has appeared as the Critics’ choice of the New York Times and Time Out London. Whether you are of the age of waiting for your letter from Hogwarts or around the same age of Dumbledore (which is really old! ), or even if you are a clueless Muggle who have no idea the difference between a Horcrux or a Hufflepuff or a veteran in the magical world of Harry Potter, there’s something for everyone. So dig out your favourite ‘wizard hat and robes’, stock up on some Chocolate Frogs and Bertie Botts’ Every Flavour Beans and make your way to klpac this 2nd to 5th June to indulge in some laughs and magic. Proudly presented by Milestone Production, tickets for this family-friendly show is now open for sale. 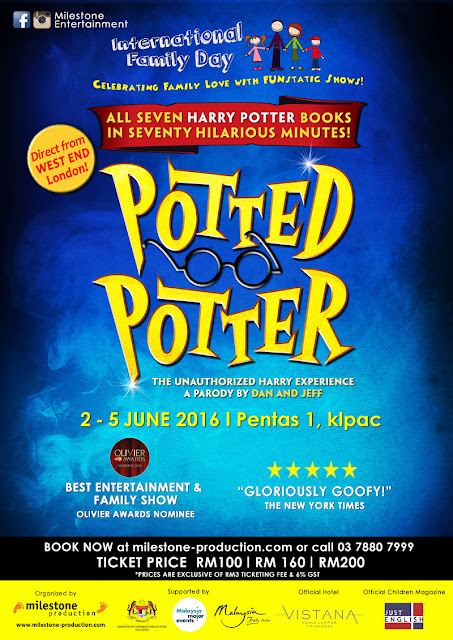 Tickets for Potted Potter are priced at RM200 (VIP), RM160 (CAT A) and RM100 (CAT B). Ticket prices are not inclusive of 6% GST and RM3 ticketing fee. Early Birds discounts up to 15% off regular ticket prices are available for ticket buyers before 24 April 2016.